Tony Iommi was born on 19 February 1948 in Handsworth, Birmingham, England. He is an English guitarist and songwriter best known as the founding member of pioneering heavy metal band Black Sabbath.Iommi is widely recognised as one of the most important and influential guitarists in heavy metal music. He was ranked number one on Guitar World’s “100 Greatest Metal Guitarists of All Time”, and in 2011 ranked 25th in Rolling Stone magazine’s list of the “100 Greatest Guitarists of All Time”. In 2011 Iommi published his autobiography, entitled Iron Man: My Journey Through Heaven and Hell with Black Sabbath. On 9 January 2012, it was announced that Iommi had been diagnosed with early stage lymphoma. Tony is mostly known for playing SG guitars – be it original Gibson models or some of the replicas that were designed specially for him. One of his first guitars was a 1965 Gibson SG Special which was nicknamed “Monkey” after a sticker visible on the front of the body. In 1975 he started working with John Diggins who designed Jaydee SG “The Old Boy” – which is perhaps his most widely used guitar to this days. In the mid 90s Iommi went back to Gibson, and played a some of his own Signature guitars. This was Tony’s first guitar. He came across it while reading a catalog, and it was the only left-handed guitar he could find. The guitar costed around £20 (around £400 in today value), and Tony’s mother bought it for him on weekly installments. Tony was around 10-13 years old at the time. As far as we know, the Watkins guitars were first introduced in the late 50s and they were available with two, three, or four-pickup setup. Tony’s model was the one with two pickups dubbed ‘Rapier 22’, and featured a Hi Lo Watkins vibrato bridge and a Gibson-style Rhythm/Lead toggle switch. Although we couldn’t find any direct statement from Tony about the finish, the guitar was most likely red since Tony was a big fan of Hank Marvin at the time who himself played a fiesta-red Stratocaster, and most of the early Watkins guitar were indeed finished in red. As Tony joined his first serious band The Rockin’ Chevrolets in 1964, he decided it was time to invest in a better guitar. The choice fell on a left-handed early 60s Burns Trisonic model, which was a noticeable step up from the Watkins. Burns was a relatively new company at the time, but already found their way into hands of high-profile performers of the time, such as Elvis Presley and Hank Marvin of The Shadows. As far as the exact model of the guitar we are pretty much clueless. After hours of search for any photos of Tony from circa 1964 we couldn’t find a single one where he’s holding the Burns guitar, and the only thing that might help with identifying the model is Tony statement that that his guitar had a control on it which said ‘The Trisonic Sound’. So, if you know anything about that send us a message using a form at the bottom of this list. This guitar was bought sometime in the mid to late 60s as a replacement for the Burns Trisonic. It can be seen during the 1968’s Rock’n’Roll Circus with The Rolling Stones, when Tony joined Jethro Tull for one gig before going back to the Black Sabbath (still named Earth at that time). Tony’s Stratocaster was a 60s pre-CBS model with rosewood fretboard, and originally featured a sunburst finish. He modified the guitar over the years, and tried to make it easier to play since he had an accident where he lost the tips of his two fingers on his right hand while he still had this guitar. He filled the frets down and lowered the action, played with the pickups, and repainted the whole body white. This guitar was used basically from the time the gig with Rockin’ Chevrolets ended in 1965, up until the recording of Black Sabbath’s first album in 1970. Unfortunately, one of the pickups on the guitar stopped working and Tony only ended up using it on one song, “Wicked World”. The rest were recording with a Gibson SG which Tony used as a spare up until this point. Tony bought this guitar in a music store in Birmingham in 1967, and used it as a backup for the Fender Stratocaster that was his main at the time. After the Strat broke during the recording sessions of Black Sabbath, Iommi picked up the SG and finished the album with it. He never went back to that Fender. This guitar was actually right handed, and Tony was forced to play it upside down. Sometime after the band finished recording their debut album, Iommi bumped into a guy who played a left-handed SG identical to his, but was right-handed. They agreed to simply swap their guitars, and that guitar eventually became the famous “Monkey” guitar that Tony used since the second album. You can read Iommi’s interview with Epiphone about this topic here – An interview with Tony Iommi. The guitar was probably an SG Special with P90s, although this is purely just our guess. If you happen to know anything about this guitar, please contact us using the form at the bottom of this article. This is perhaps one of Tony’s most iconic guitars. He got it in exchange for the regular right-handed SG he used on Black Sabbath’s debut album, and from that point it became his main guitar. After getting the guitar Tony went to John Birch’s shop for some modifications. His left-handed SG received a brand new Simplux pickups in the neck, which was John Birch’s take on the P90. The bridge pickup was also taken out and re-wound, and then re-covered in metal casing. The neck was refinished with a coat of polyurethane lacquer to improve playability, and a zero-fret was installed next to the nut. He also decorated the guitar with a sticker of a monkey playing a fiddle. Tony used this guitar on Paranoid (1970), Master of Reality (1971), and Vol. 4 (1972). He then retired it and just recently sold it to the Hard Rock Cafe museum. This guitar first appeared on some photos taken during the recording of Paranoid album in June 1970. The guitar was either a 1962 or 1963 model, so depending on that it was either named a Les Paul or an SG Custom. Tony was quoted saying that he recorded the song “Paranoid” using a Les Paul, so that might have actually been this guitar. All the other songs were allegedly recorded with the SG Special. Tony used this guitar for couple of gigs in 1970 most of which were recorded, but he eventually stopped using the guitar completely towards the end of the year. There are stories that it might’ve been stolen, but we haven’t been able to find anything specific. This guitar was built for Tony circa 1975 by John Birch, who previously worked on Iommi’s SG Special. It featured black finish, 24-fret neck with cross inlays and ebony fretboard, stainless steel pickguard, and it was fitted with two John Birch Magnum pickups. This was Tony main guitar used on albums Technical Ecstasy, Never Say Die, Heaven and Hell, and Mob Rules. It was used extensively during that period, and up until around 1980 when he started playing the Jaydee SG. Around the same time Birch SG was built, John Diggins also started working on a guitar intended for Tony. He built the guitar in his own time while still working for John Birch, and just couple of weeks prior to joining Black Sabbath road crew as Tony’s guitar tech. The guitar featured 24 fret neck, Schaller fine-tuning bridge, transparent plexiglass pickguard, a custom wound pickup by Diggins in the bridge position, and a modified John Birch Magnum in the neck position. It had four control knobs, but only three of which were functional, and a disconnected second output jack. The guitar has peeled and cracked finish which was a result of it being left in a car on a hot day in Brazil. A couple of more factors contributed to this though. First of all, the guitar was built on Diggins’ kitchen counter where he didn’t have proper tools or the environment for a professional paint-job. And second, he had to rush the whole process since he was due to join Tony as his guitar tech for the US tour. This guitar was first used for overdubbing on Heaven and Hell, but didn’t get any stage time until early 80s. From around 1983 it essentially became Tony’s main instrument, taking place of his older John Birch SG. Guitar built sometime in 1981 by John Diggins as a spare one for Tony’s main SG. It featured SG style body, custom headstock design by Diggins, two dual-rail humbuckers, locking nut, and what looks like a Kahler 2300 tremolo bridge. Tony actually had another identical guitar in black finish, which can be seen in the music video for “Zero the Hero”. These guitars were used since the early 1980, and quite possibly until early 90s. Both of them are currently owned by RockStarsGuitars.com. This was a newly released guitar by B.C. Rich, and Tony used it for a brief period of time since it’s release in 1983 – perhaps most notably during the StarLick instructional video. Tony’s Ironbird featured black finish, scalloped neck, cross inlays, Kahler bridge, and two DiMarzio pickups with built-in preamps. It is not known if he ever recorded with this guitar. Used around the same time as the Ironbird, most likely as a spare/backup guitar. This guitar was built for Tony by Gibson master luthier J.T. Riboloff. It was based on a SG Custom, but featured 24 frets and a floating Floyd Rose tremolo which Tony needed in order to play couple of songs live (Mob Rules is most often mentioned as an example). Since the body of an SG guitar is too thin to actually hold a Floyd Rose without it sticking from the bottom, our guess is that the tremolo block was shortened by Riboloff, and the top piece of the tremolo was probably mounted on the body level, instead being sank in a cutout as usual. This was a prototype and the initial idea for Tony Iommi Artist Model guitar. The first one was finished and delivered to Tony in 1993, featuring natural finish. According to RockStarGuitars.com, two more guitars were made after that, both finished in black. Used from around 1994, up until the point Gibson released Tony Iommi Signature model in 1997. After that point this guitar was discontinued. The guitar featured Brazilian mahogany body and neck, 24 frets (w/zero fret), cross inlays, Sperzel locking tuners, Schaller fine-tuning bridge, and a pair of Seymour Duncan pickups specially designed for Tony. Tony had four of these guitars, all finished in black. They are currently in possesion of the guys at RockStarGuitars.com. Another SG with tremolo appeared sometime in the late 90s, this time a Custom version of the SG with white finish. This guitar is a lot more recent at least from the looks of it, since it features two Tony Iommi signature pickups from Gibson which were first made circa 1997. It also has a few other minor details worth mentioning – like the two Fender Jazz Bass knobs instead of the original Gibson ones (quite common on Iommi’s SGs), and two little iron crosses which cover the holes left after removing the original stop-tail bridge. This was one of two prototypes built by Gibson Custom Shop in Nashville as a blueprint for Tony Iommi Signature SG. It was delivered to Tony in late 1997. This guitar features red finish, a neck with 24 frets and custom cross inlays, four control knobs with only two of them actually being functional, and two Gibson-designed Tony Iommi signature pickups. Tony first used this guitar on the last gig of the Black Sabbath reunion tour in 1997, and continued using it as one of his main guitars until 2010 when he announced on his website that this guitar was stolen after a gig played on July 24th. He has been offering a reward for its safe return on his official website at www.iommi.com. The second prototype was finished around the same time, and it’s essentially identical to the guitar above, except that it features a black finish. This is a replica of Tony’s old “Monkey” SG, built by American luthier Lou Moritz. Tony used this guitar partially on the new album “13” and on the following tour. If you’re interested in the process and step-by-step pictures, they are available at LuthierTalk.com. Tony’s acoustic guitars are a lot harder to list in a chronological order due to lack of photographs and video material. He allegedly has a vintage Gibson J-45 which at least according to some interviews seems to be one of his oldest guitars – used way back on the song Fluff from the 1973 album “Sabbath Bloody Sabbath”. More recently he’s been using Taylor guitars like the Taylor 815L model, and Taylor T5s which was seen on Classic Albums documentary. Epiphone PR-350C was supposedly used used on I Go Insane from the 2005 album “Fused”, and a Washburn EA30 was also owned by Tony at some point according to RockStarGuitars.com. Used in the late 60s prior to entering the studio with Black Sabbath. Known among some as pre-Supergroup. Tony used it on Black Sabbath and Paranoid albums. Supposedly used on Master of Reality. This was Tony’s main amp since the time Paranoid came out, up until the very late 80s. Used partially on Technical Ecstasy in 1976 when Tony tried experimenting with his sound some more. Tony went through a Mesa Boogie period starting with around 1982, and used the amps peridically up until the early 90s. 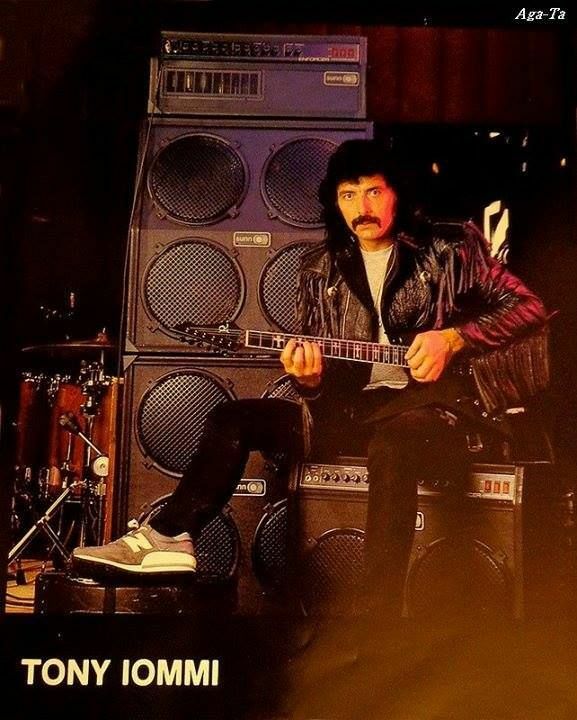 Tony did an endorsement ad for Sunn amps sometime in 80s [Sunn Amps ad – Tony Iommi], although it is not known whether he actually used any of the amps. If you happen to know more details behind this endorsement, please be sure to contact us. This amp was specially designed for Tony in 1993, and it has essentially been one of his main amps ever since. It has 3 channels and EL34 output tubes. Used on The Devil You Know with Heaven and Hell band in 2009. Newest signature amp from Laney for Tony Iommi released in 2012. This one features 2 channels, 6L6 output tubes and three-band EQ. Used in the early days. The pedal was modified by one of Tony’s roadies to pack up some more gain. Apparently in 1979 when John Stillwell worked on Tony’s Marshall for Heaven and Hell album, he threw away the pedal without Tony’s knowledge, and that was basically the end of it. Tony got this pedal in 2001 in order to replace his long-lost Dallas Rangemaster. Alex from Analogmen offered to make him a clone, which eventually ended up being a prototype for the Beano Boost pedal which is now available for regular customers. Used in the early days of Sabbath. More recently he’s been allegedly using the Chicago Iron’s recreation of the Tycobrahe. Uses as a part of his recent rig. There’s some talk about an octave pedal being used on the studio version of “Paranoid”, but that seems unlikely considering the fact that octave pedals weren’t really a thing in 1971. There’s a possibility he used some kind of a ring modulator thought. Modified by the guys from Analogman. Used on the recent Heaven and Hell tour. Used in the early days. Used on acoustic guitars, usually tuned semitone down. His preferred string gauges are rather unusual: .010, .012, .021w, .026, .030, .035.